This past week marked the annual SpringFest capstone event hosted by MUSIC Matters. Founded in 2011, MUSIC Matters purpose is to “utilize the power of music to unite the Michigan community and promote educational accessibility.” The organization spends the entire year hosting various events on and off campus to promote music and create cohesion amongst students. SpringFest is their culminating project that attracts an audience of 10,000 people for their daytime and nighttime events. This year, the Daytime festival took over State St. and North U., hosting over 80 student organizations, 7 food truck vendors, live performances, and various pop-up shops. One of the newest additions to this year’s Daytime festival was hosting Ann Arbor artisans. Traditionally, corporate sponsors were invited to have pop-up shops but this year focused on inviting smaller companies and student sellers. Aside from this addition, the festival included live dance and music performances from student organizations such as Maize Mirchi, the Men’s Glee Club, and FunKtion. Another component of the festival that I personally enjoyed was the presence of various orgs that promote health, wellness, and sustainability. There were interactive events for yoga, sustainable food practices, and CAPS even had representatives from their CAPS In Action student committee. It was really inspiring to see so many talented, ambitious, and creative students showcasing their work and talent to the campus community. Following the immersive Daytime festivities is (what I believe to be the more known of the two) the Nighttime Concert. 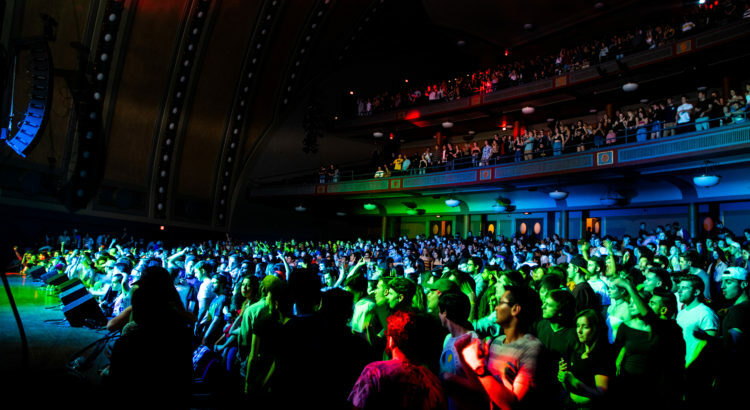 Since 2012, MUSIC Matters has hosted artists Common, J. Cole, 2 Chainz, Migos, and Lil Yachty in Hill Auditorium. As a junior who is also a big fan of well-known hip-hop artists, this was surprisingly my first time ever attending. 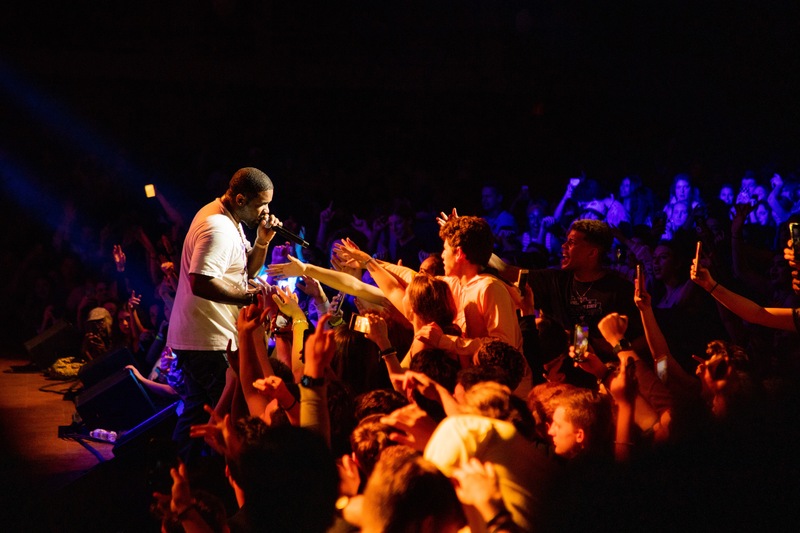 This year’s headliner was A$AP Ferg, otherwise known as a member of A$AP Mob. Amongst some of Ferg’s most popular songs are Plain Jane, Shabba, New Level, and Work REMIX. 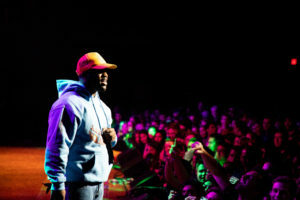 His opening acts consisted of two DJs and two performance groups. The first DJ was Jeff Basta. Had it not been for him being the DJ to play as people were still entering the auditorium, I think he could have gotten a lot more energy out of the audience. I really enjoyed his music choice and his energy while playing was admirable considering not many others were entertained/paying attention. The second DJ was Namix who served as a transition for the first opening act — Tracy Money (IG: prodbytracy). “TracyGang #333” is a group of three current and former U-M students who go by the names of $cottie Pimpin’, Fatz, and Tracy D. Although this was not my first time seeing them perform, this was my first time seeing them own the stage in a large auditorium. Their performance got the crowd on their feet and ready for the night. Following Tracy Money was B Free from Detroit. I could be biased, but my personal preference for style, originality, and overall entertainment purposes would choose Tracy Money over B Free’s performance. 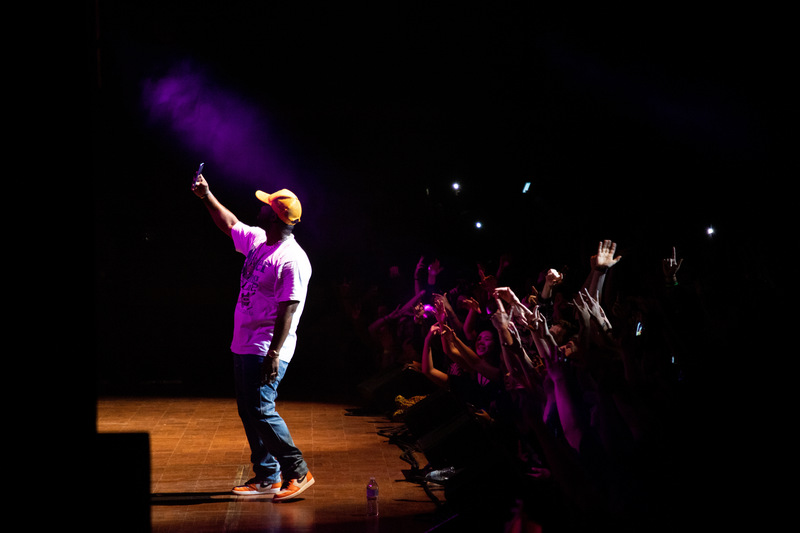 Nonetheless, both performances were a well-needed segway into opening for A$AP Ferg. Ferg was full of energy and was an authentic performer. You could sense his desire to be just as engaged with the audience as we were with him. However, this desire quickly led to some shockingly inappropriate comments on his behalf targeted at several women in the audience. I think it’s reasonable for a performer to want to feel more connected with the audience and interact with them but to single specific women out and express sexual desires in front of everyone, into the microphone, was embarrassing and disgusting. The remainder of the concert left me feeling odd and distraught as I was stuck questioning “Did he really just say that”?? Carrying on, he performed all of my favorite songs and it was a fun concert. I’m certain that this will be remembered as one of my favorite undergraduate experiences, despite the belittling comments that put a damper on my overall impression. 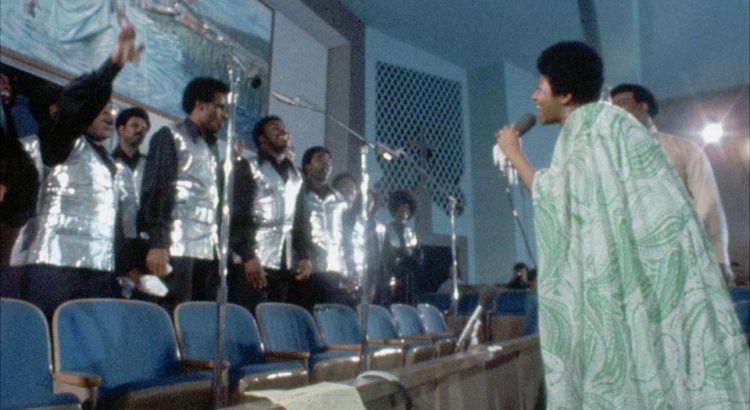 Forty-seven years after the release of Aretha Franklin’s album Amazing Grace, which went on to become certified double platinum, the best-selling disk of her entire career, and the highest selling live gospel album of all time, viewers are offered a window into its recording. Amazing Grace opened Friday, April 19 at the Michigan Theater. Don’t miss your chance to witness the Queen of Soul in this monumental documentary. As I entered the Emagine Theater located in Novi, MI, I wasn’t prepared to experience a visual and musical presentation that would change my attitude and outlook on my life going forward. This experience consisted of watching the short film created by R&B artist, Khalid, called Free Spirit and listening to his newest album titled Free Spirit that played afterwards. With that being said, I would like to comment on the experience as a whole. As the visual presentation began, the lights dimmed and the screen primarily showed Khalid himself giving an introduction to his show. He welcomed the fans that had attended the event and thanked us all for coming to experience the short film he had made. Ultimately, his comforting presence was consistent throughout the presentation and I felt glad that he was taking the time to connect with the audience in this way. Shortly after this introduction, the short film, Free Spirit, began. It opened up with a montage of scenes depicting the vast desert-like countryside of an unsaid Southern state, the calm, small-town essence of a neighborhood on the outskirts of a big city, a high school gym with senior prom decorations, and the teenage hangout places of modern suburbia. Meanwhile, one of the songs from his album played in the background, fitting the nostalgic, emotional, and free-spirited essence of the montage perfectly. The film was constructed around these scenes and told the story of a group of teenagers who were on the brink of seizing the freedoms of true adulthood. The story mainly follows a girl who goes by Ladybug and who joins her group of friends on a road trip after being kicked out of her intoxicated mother’s house. All the while, the group emulates the essence of teenage freedom: feeling the open air while standing outside the sunroof of the van that they stole, drinking alcohol and smoking weed, and proving themselves unstoppable against the world. Eventually, things begin to fall apart as apparent romances between some of the friends divide the group completely, and the film ends with a devastating consequence for one of the friends as a result. The ended proved to be my favorite part of the film because of how emotional it was and how unresolved it was. I believe it portrayed the struggle that young adults have to find themselves and to make it in this world as adults, and how it seems that we will constantly struggle to find ourselves completely even as we get older. 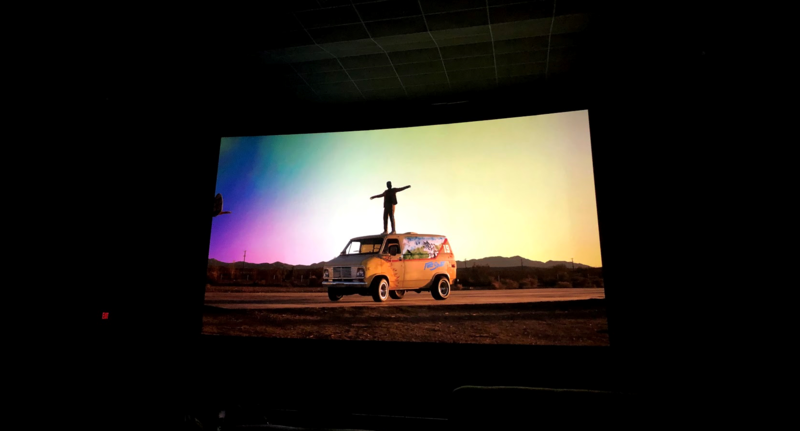 After the short film ended, Khalid played his new album, Free Spirit, before its worldwide release with visuals and commentary accompanying it. Overall, I really enjoyed this experience and felt that visuals accompanied by the music allowed me to enjoy the meaning behind the music in a better way. Ultimately, I very much appreciated how this short film portrayed the lives of young individuals. As the film showed, anyone from any background essentially experiences the same struggles as a young adult and I felt that it validated the truth about how youthful questioning exploration doesn’t quite end with our childhood. I was very excited to see That Brown Show, and so, it seems, was everybody else in the audience, because they were much more boisterous than usual. In most other settings, this would have been somewhat irritating (in some parts, the audience cheered so loudly that I could barely hear the music), but after attending so many Indian student performances, I’ve accepted that this exuberance is simply part of the show. I think all the ensembles did a very nice job, but I know I’ve seen much better from some. Sahana Music could have been a little more balanced – the vocalists didn’t perform much, while there were several percussion solos – but I loved the harmonium solo. Taal is capable of far more than what the piece they performed let on. The storyline of their dance, Robin Hood, could have been more connected to their choreography. The choreography itself seemed more fit for a nightclub until they started incorporating movements inspired by Indian classical dance, which they performed much more gracefully. It is possible that this was a deliberate juxtaposition between the more graceful Merry Men and the decadent King Richard, but if so, a more obvious difference would have helped. The Michigan Bhangra team had, as always, a very energetic performance, and their movements were crisp and unified, even those of the handkerchiefs they were flicking around. I wish they hadn’t had a video playing in the background, because after I noticed it all it did was distract me. Michigan Manzil had a really cohesive performance, and I was amazed at the unison they displayed despite the throng of people onstage. Their storyline for the dance – 21 Jump Street – worked really well with their performance, and their style and energy remained consistent throughout even when they were blending moves from different genres of dance. Sahana Dance was my favorite: they did a beautiful job of blending the three styles of dance that were represented onstage. Often, they take turns highlighting each dance style, but this time they managed to dance at the same time, and it worked really well. And they had some really unique music choices (that transitioned well) and some beautiful geometric formations. Michigan Izzat, as per usual, had a really tight performance with their hallmark crisp movements and a very well implemented storyline. Someday, though, I’d like to see them do more lyrical movements. I think it would add a lot of range to their repertoire, and I know they’re skilled enough to perform them. Lastly, Wolveraas had some really lovely musicality and very consistent energy, and they didn’t let that slip even despite a couple minor mishaps. This year, TBS was a competition – why I don’t know, and I hope it isn’t actually going to happen annually – and Izzat won the audience’s vote. Strangely, Hill Auditorium as a venue didn’t seem to help anyone. Somehow the sound seemed muffled, not as bright as usual, and that leeched energy from everybody’s performances. This was not helpful, because these performances require a lot of energy, and I realized then that not all of that can come from the performers. But that couldn’t really be helped. My last note, though, is something that can be fixed: I really wish they would get their tech together. There were some hiccups with videos, sound editing, and sound balance that seem to happen at every show, and I know those are things that are so easily fixed with some minor attention to detail. The cold, rainy Saturday that we experienced just as spring was beginning to grow left many of us disappointed with the mood that the weather brought that day. Even so, I was lucky enough to attend a performance by Lisa Hilton at the Kerrytown Concert House that day, an event that warmed my spirits as it sheltered us from the cold outdoors. As expected, a large proportion of the people who attended this event were older and only a few of us were younger adults. However, I came to realize how much this disparity didn’t matter because of how Lisa Hilton was able to connect to us with music that was universal. During her conversations with the audience, Lisa Hilton spoke very politely and gave her commentaries in an organized manner. In other words, she was able to articulate the exact motives behind each of her pieces very well and I believe this helped us recognize the importance of the messages of each piece. In the minutes during which she would play, you could tell that she was passionate about her performance and her compositions. She would sway on the piano bench, look up at the ceiling and back down at her hands, and look to smile at the audience while playing her pieces. As I noticed this, I thought about just how many hours she had dedicated to this moment: to be able to play a full-length piece that she wrote and to perform this piece without making mistakes undoubtedly took numerous hours of the majority of the days in a year to master. With this, I develop a large appreciation for musicians like her who dedicate so much of their time to perfect their craft. In terms of the style of her compositions, I was very pleased to hear something unique yet simple. During one of her commentaries, she explained to the audience that she wanted to be able to inject emotion into her pieces; she could do so much to master an exceptionally difficult classical piece but even that may not be able to truly convey her feelings, and so she took to writing from the heart in every circumstance. As she demonstrated her mastery of the technical aspects of the piano, she made evident throughout her performance her mastery of musicianship, creating a modern style with abstract melodies and filling these melodies with jazz-like rhythms. Overall, I was pleasantly surprised by the caliber and soul of Lisa Hilton’s performance. She was able to convey her emotions through her pieces by using a unique style with universal moods. After attending this performance, I left the venue glad that I was able to de-stress with an event showcasing the impressive and beautiful work on the piano. As I locked my bike on a rack on Main St, I rushed over to the opposite side of the street to make the long line that was spewing out of the door of the Ark: the venue at which Haley Heynderickx would be performing. People among all types of demographics made up this line: elder couples, younger couples, grungy teenagers, and families. I wasn’t expecting this diverse of a group of people to be in line to watch Haley perform; yet, after her performance, it became so much easier to understand why she could draw everyone in who was listening. The Ark filled up quickly; as soon as I acquired a decent seat to the left of the stage, I remained in it until the end of the show so that I wouldn’t lose it to the floods of people continually coming in. Comfortable with the seat I was in, I immediately felt the excitement within me that comes when the lights go low and the performance finally begins. The production began with a opening musician, a component of the performance that I don’t think any of us were expecting but welcomed nonetheless. This musician was usually a part of Haley’s band during her larger performances, but was given the opportunity to open and perform her own art. I was very impressed by the opener’s performance as she was able to create unique sounds with the few instruments she had, such as the grand concert harp, synthesizer, and voice. Soon after her performance, we took an intermission and then were brought back together for the main act. As soon as Haley entered the stage, her persona was evident. Having made this return to the Ark, I could hear people cheering extra loudly as she entered because they knew that she would put on an entertaining show. She immediately showed an elevated surge of quirkiness and subtle awkwardness. However, she was simultaneously pleasant and very easy-going, which altogether made her absolutely comical. Hailing from Colorado, I could sense her background, the essence of how she was raised and how in touch she was with her natural roots. I would come to find out that this essence that she brought as what seemed like a spawn of the Earth itself went hand-in-hand with her down-to-earth personality. This real, down-to-earth personality shined through her musicianship. Giving a warm glare of the indie genre, I could feel a slight aggression from her lyrics and the tone of her voice that gave a more substantial light-heartedness than the stereotypical airy light-heartedness of indie music. This raw, rich tone allowed her music to soar as an original composition and I felt that I could credit her as a true musician in that way. She shared her musical influences as result of taking questions from the audience in between songs, and you could sense the passion she had with performing the music she created as a result of being inspired by them. Overall, Haley Heynderickx put on a compelling show with a warm personality and simple yet original musicianship that allowed me to understand why most people never wanted her to end her show, never wanted her to leave, or come back to Ann Arbor at the every least if she had to leave. After attending this performance, I was able to solidify my interest in small performances and be reminded of how enriching and fulfilling they can be.